Comics In 5 Panels: Johns Month(and a half): Flash part 3. Alright, let's finish the review of Johns' Flash run(issue 201-225). Oh, and if you should ask: No, I'm not going to review Johns' series with Barry Allen as the Flash. That would require that I bought it, and since I'm not made out of money, I only buy comics I believe I will enjoy. And after reading "Flash: Rebirth," I highly doubt that I would. It takes place at night, the city is pretty much taken over by the Rogues, and the cops can barely do ANYTHING to stop them. If I didn't know better, I would have thought the plot took place in Gotham or Bludhaven! Hell, Mr Element(the bad guy of the story) is a very dark character too, and seems like one of Batman's enemies. Even the art looks like something from Hell Boy! Not that there is anything wrong with that, it's just... weird. But the story is pretty good, actually. The mood is perfect for how Wally is feeling at the moment, with losing his twins, having trouble connecting with his wife, getting used to his night-job as a mechanic for the police, and having a feeling that something is missing. My favorite part of it, is the short-lived friendship between Wally and Captain Cold, as they meet each other at a diner, not knowing who the other is. They are just two guys, no costumes, no super-speed, no cold guns. It's nice and bittersweet. After that, it gets back to classic Flash style in issue 207. As I said, the stories are not as good. This is partly because Scott Kollins being replaced with Howard Porter as the series penciler. Not that Porter is a bad artist, but I just really liked Kollins style and I see him as the unofficial Flash artist(kinda like Amanda Conner is the unofficial Power Girl artist). But it still had great elements, such as the Rogues becoming a actual super-villain team again. And actual teams of super-villains was something that haven't been used in comics for a long time. And if bad guys decided to join forces, it was short-lived. But the Rogues were an actual team. They have rules(such as; no drugs, and never kill children), a sense of honor, and they are loyal to each other. They even have their own graveyard, where they bury their fallen comrades in crime. But... the story-line "Rogue War" was pretty disappointing. Mostly because of the lack of, you know: WAR! 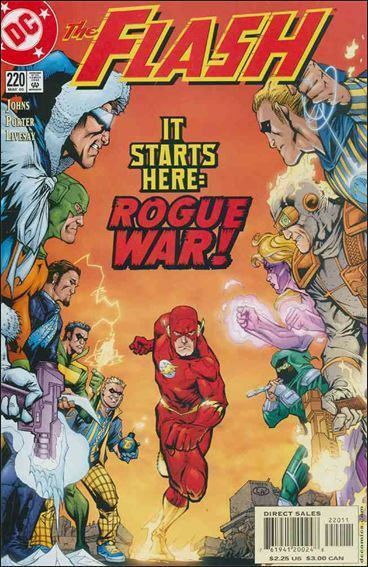 "Rogue War" is about the reformed Rogues(Pied Piper, the original Trickster, Heatwave and Magenta) who has decided to take down their former allies in crime. There was a lot of buildup for this final Flash story-ark, and that's why it's so sad, that the war didn't last more than two issues. Sure, the story-line is a six-parter, but only two issues was about the Rogues fighting each other. One and a half, to be honest. Another thing that's wrong with the final part of Johns' Flash is how his writing is affected by the event "Identity Crisis". It could be argued, that Johns had to accept that Barry had agreed to brainwash Doctor Light was now continuity, and just write as well as he could. But he actually makes it worse by making Barry brainwash one of his enemies, The Top, so that he would become his partner. And then tell us, that the reason to why some of the Rogues turned away from crime was because Top brainwashed them! It's... ANNOYING! So, there are some problems, but it's still good. Not perfect, but good. I could have lived without the brainwash thing and the Rogue War, but I'm still glad that I owe the whole series in omnibus form. I highly recommend the series as Johns' best written work to date. Next time, I'm going to tell you about my least favorite Johns comic of them all: Infinite Crisis.